Sun's out, fun's out! Now that the sun is regularly out, I've been working on my tan, but the sun has also been so hot lately that I've definitely felt the effects of it at the end of the day. 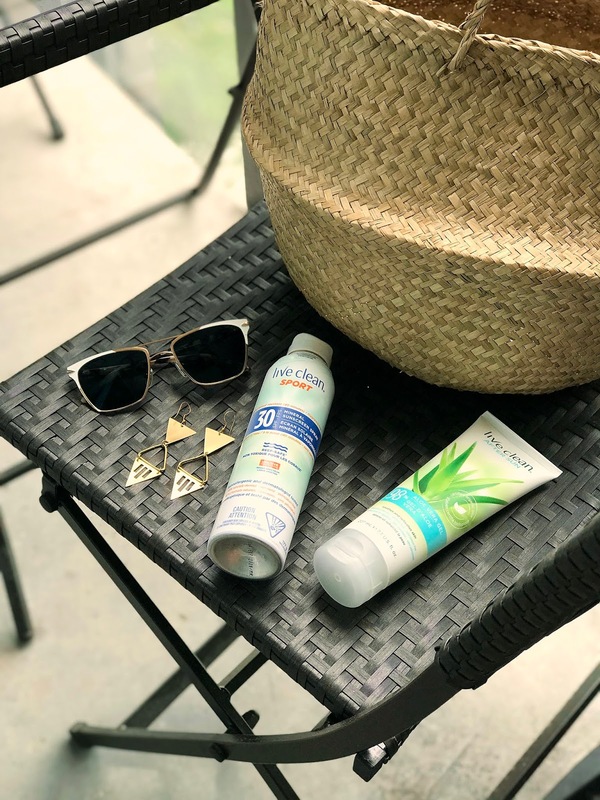 Two products I've been using lately to combat the sunny weather is Live Clean's Sport Mineral Sunscreen Spray and their After Sun 98% Aloe Vera Gel. The Sport Mineral Sunscreen Spray ($21.99 CAD) has SPF 30, is water resistant, non-greasy, and doesn't leave a white film. A main feature of the packaging is the continuous spray technology which is different from other petroleum-based propellents because this allows Live Clean to use eco-friendly propellents such as pressurized air to dispense the product. Once again, I love how Live Clean strives for an ethical and eco-friendly mandate. What I love about this sunscreen is how it feels on the skin. I'm not sure if it is because it is a mineral sunscreen, but it feels so lightweight on my skin when I apply it and doesn't leave a greasy feeling. I also like that it has an SPF of 30, because it's the perfect amount for every day use. In terms of "sport" though, I do think it might not be as effective if you were to use it for heavy sun exposure, although it is water and sweat resistant. 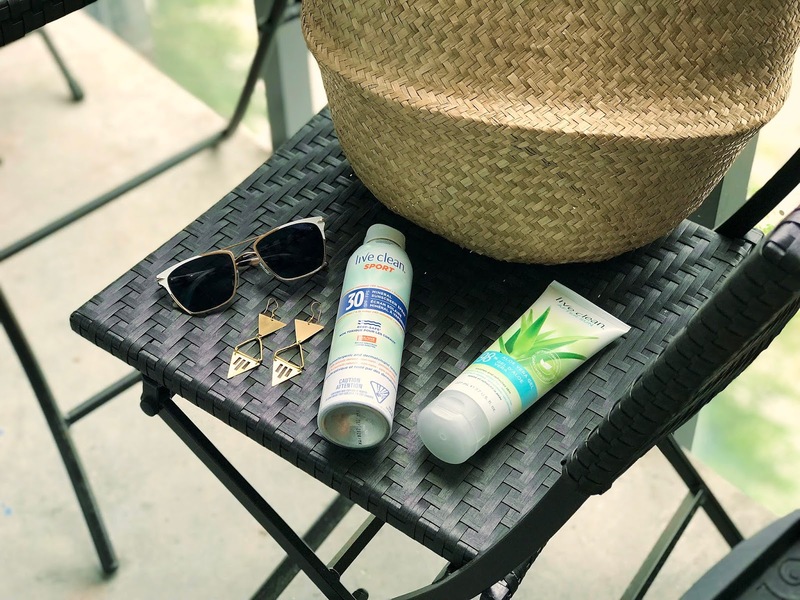 Mineral sunscreens are the best to use because unlike chemical products, the product sits on top of your skin and can be applied as soon as you are going into the sun. I like knowing that what I'm applying on my skin won't be absorbed into my body and since the Live Clean Sport Mineral Sunscreen is 98% plant derived, it is not harmful unlike other sunscreens. The second product from Live Clean I've been reaching for lately is the After Sun 98% Aloe Vera Gel ($8.24 CAD). On days when I have been out of the sun for a little too long, I've been rubbing this into my more irritated areas and is it the most soothing gel ever. It really is just Aloe Vera, but I love how practical it is in the tube, and it also contains Tea Tree Oil and Arnica Extract, which gives the gel a fresh scent. Another plus is that you can use this gel to sooth insect bites, shaving nicks, and other minor irritations. Have you tried anything from Live Clean's sun care range? If you're interested in these products, Live Clean can be found at Shoppers Drug Mart, Walmart, and Well.ca. Disclaimer* Press samples sent for review.